To attract ballyhoo, float a block of chum behind the boat. 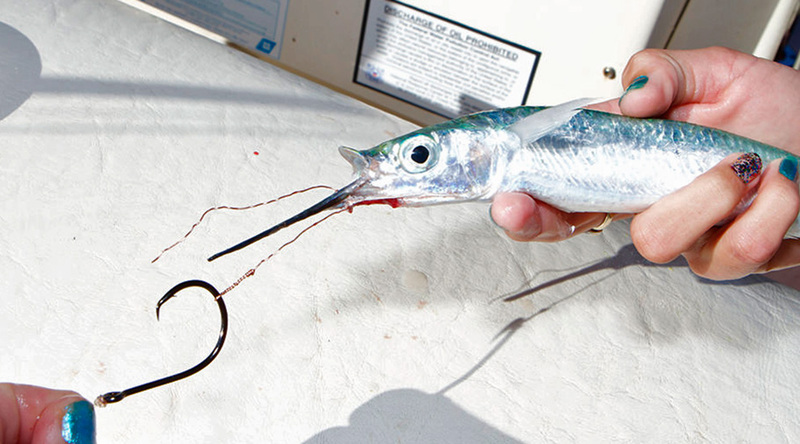 Once the ballyhoo school up, squeeze a small piece of shrimp onto a #10 hair hook. TIP: Mash up a shrimp and stick it to the back of your hand. This offers a supply of bait that's readily accessible when the ballyhoo bite is on. Put a cork on the line about 18 inches up from the bait, and throw it about two feet past the ballyhoo school. Give the shrimp a moment to sink and then slowly reel your hook bait through the school. When the ballyhoo bites, just keep a steady retrieve without jerking the line. Lift the ballyhoo into the boat gently without swinging it around. 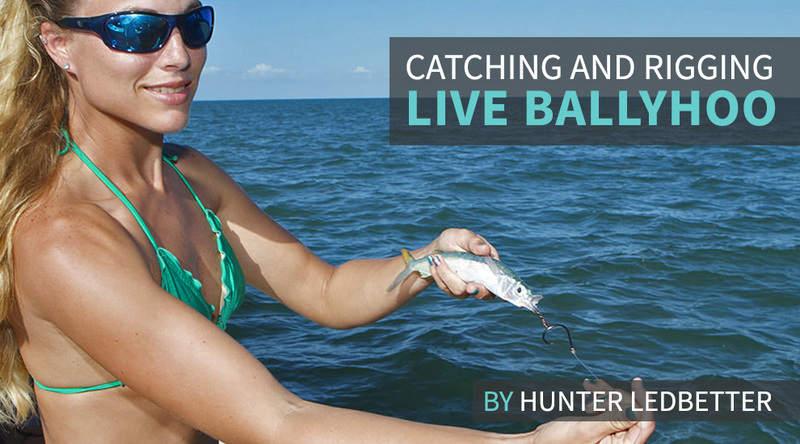 Try to get the ballyhoo into your bait well without touching it. 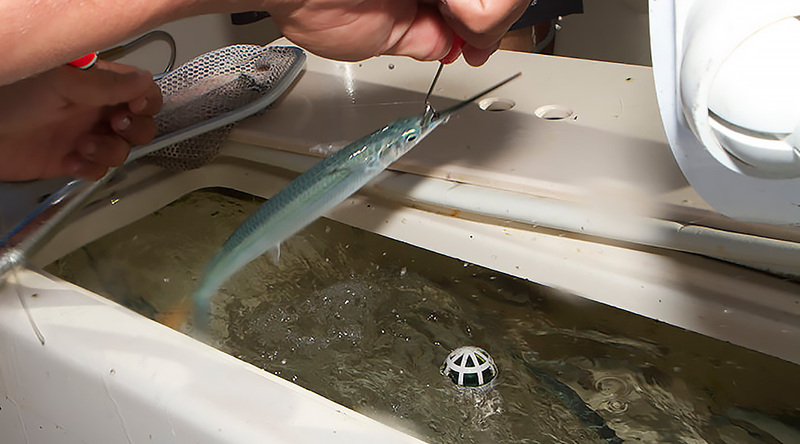 If the ballyhoo comes off the hook before making it to the well, use a dip net to gently scoop the ballyhoo up. It's very important to handle the baits as little as possible when catching them. The less you handle the baits, the longer they will live. 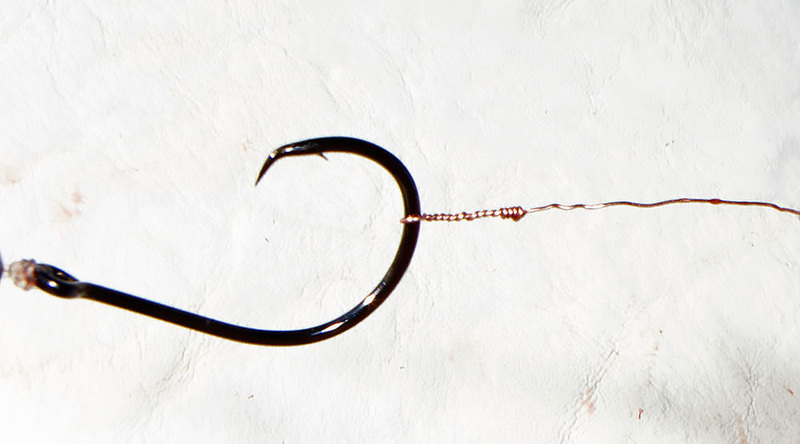 To rig up a live ballyhoo, start by tying a small piece of copper wire to the bend of a live-bait hook using a haywire-type twist with very tight wraps at the end. Be sure to leave at least 5 inches of wire on the tag end. 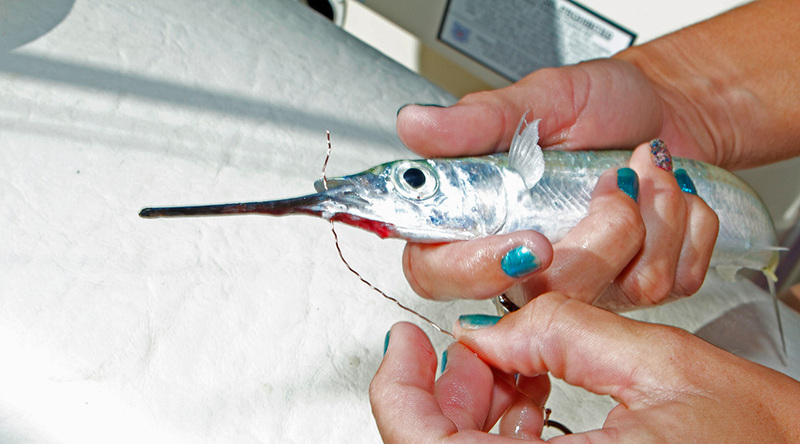 Take the tag end of the wire and push it through the soft underside of the ballyhoo's mouth. 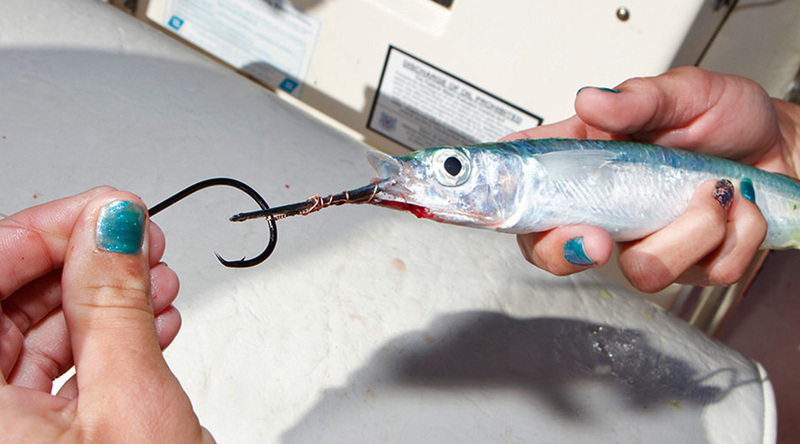 Don't run the wire through the top of the bait's head, as the bait will need to open its mouth as it swims. Pull the wire until the two halves of the tag end are of equal length. 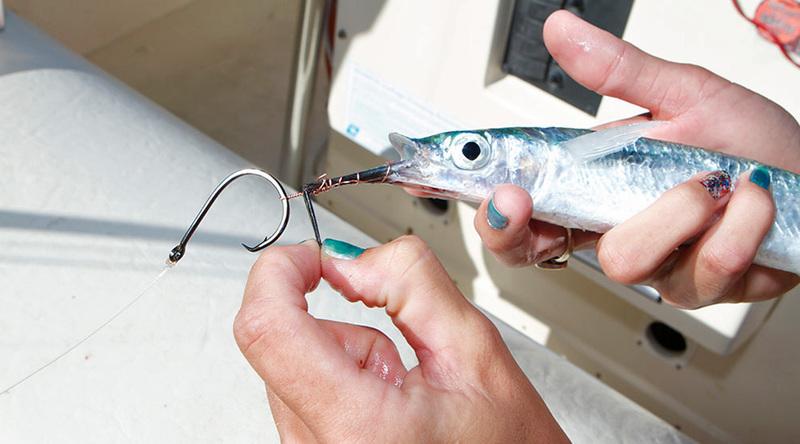 Wrap the free end of the wire around the bait's beak, starting with wider loops and ending with tight, close loops. Note that the hook never touches the bait. 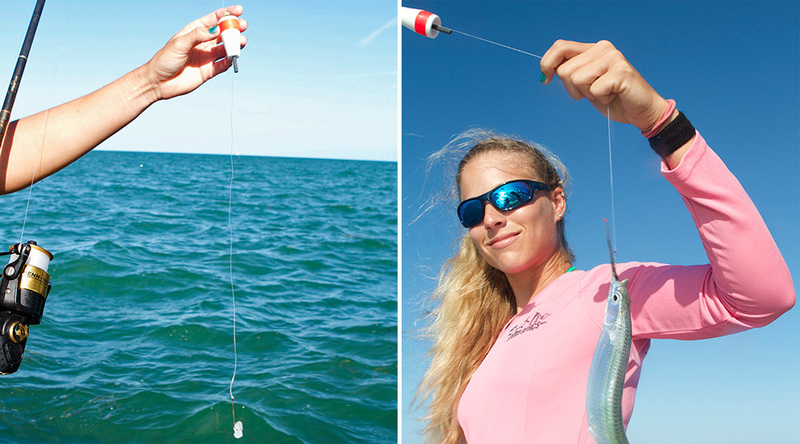 Break the bait's beak with a sharp 90-degree snap without damaging the lower jaw. This will keep the bait from fouling up and allow it to swim more naturally. Toss the live ballyhoo out gently -- just enough to get it out past the motors and into the strike zone. 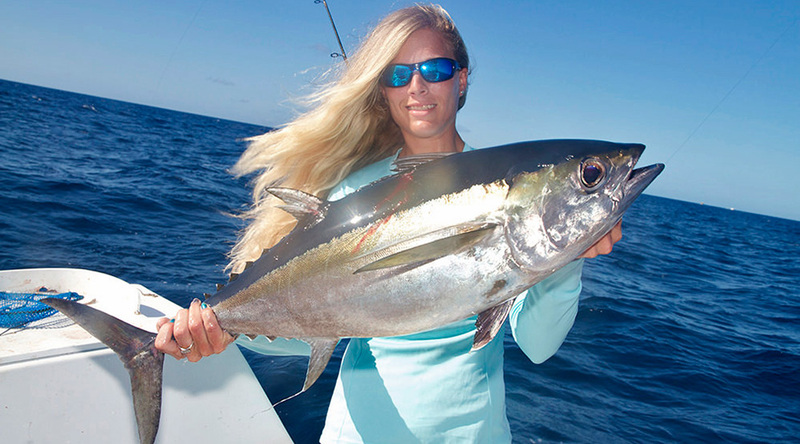 Live ballyhoo make an irresistible treat for a number of pelagic game fish, including this healthy blackfin tuna that Darcy caught on a live 'hoo in the Florida Keys.